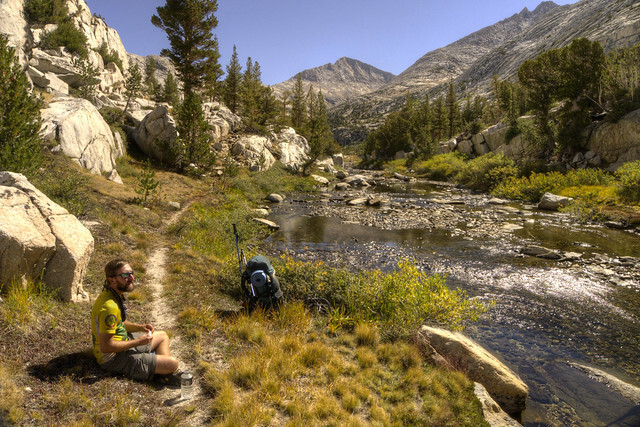 "Alright," I said to Lightfoot on our John Muir Trail hike in 2012. "Smell this sock again and tell me if the baking soda made any difference." The sour look on his face gave me the answer as he slowly handed the sock back to me. After a while on a long distance hike, you start to lose your ability to smell yourself, at least to a certain point. This is a blessing when you're alone, otherwise it's a curse. It would be great if I was a cartoon and could just look up to see if there were stink lines drawn above my head, but sadly I'm not, so Lightfoot offered to smell my socks after a thorough rinse and again after they had soaked in a baking soda and water solution for thirty minutes. Only a true friend would take a bullet like that. "Hmm, alright, next time I'll let it soak longer or add more baking soda." I began experimenting with environmentally-safe ways to clean my clothes in the backcountry after hiking the Appalachian Trail. Since I started backpacking, I've pretty much started to define "clean" as "dry," so don't get me wrong, clean out there isn't the same thing as clean at home. I decided, however, that long-distance backpacking would be more enjoyable if I could feel cleaner. Being tranquil and at peace in the natural world is a lot easier if you don’t smell like a corn chip’s foot. That's why cleanliness is next to godliness, and why you haven't seen a drawing of Buddha with stink lines above his head. First, I pack a recycled plastic bread bag or a one-gallon Ziploc and at least 2 tablespoons of baking soda. Since I'm usually only washing one or two pairs of socks, a pair of underwear, and a lightweight shirt at one time, the bread bag or Ziploc is big enough. 1. After setting up camp at the end of the day, I put the offending clothes into a one-gallon Ziploc bag. 2. Then I add water. Don't put the clothes directly in the water source. Clothes hold residual detergents from previous washes, which you may see proof of in the form of suds during the next step. Clothes may also contain other chemicals from deodorants, bug sprays, etc. 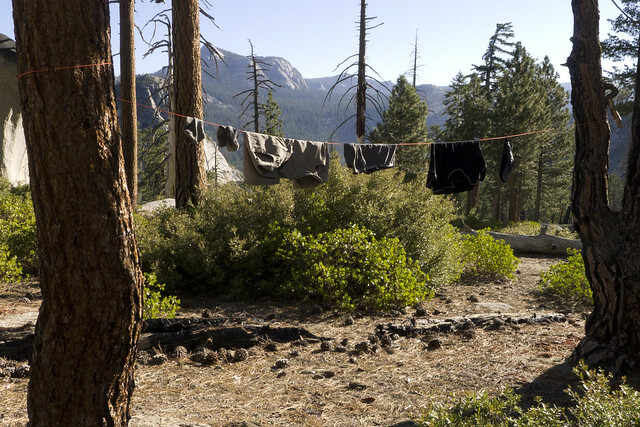 Consider putting your backpacking clothes through another rinse cycle after you've washed them at home. 3. 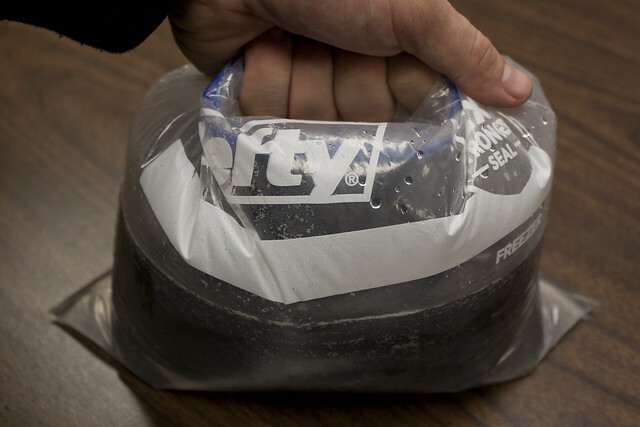 Seal the bag with a little bit of air inside. Now, shake it vigorously. This is where most of the cleaning happens, and the longer you agitate the clothes the cleaner they'll get. 4. 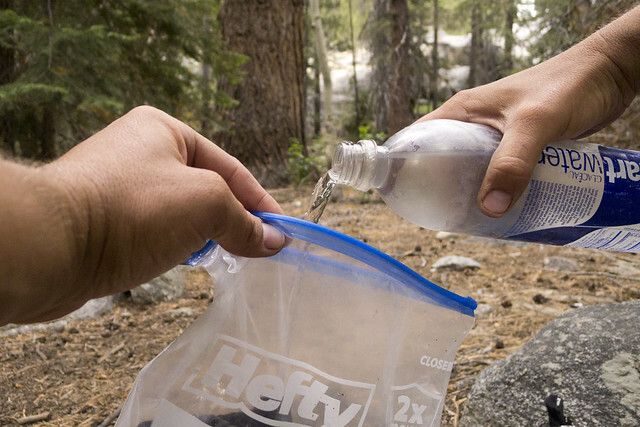 Make sure you're at least 200 feet from all water sources then empty the bag and squeeze as much water out of the clothes as you can. Avoid twisting wool and synthetic fabrics when wringing out the water. It's less damaging to roll them up and squeeze the water out. Repeat steps 2 through 4 as often as necessary. I usually do it 3 to 5 times, and agitate for at least a couple minutes each time. This alone will make a tremendous difference, and more so the longer you agitate and the more times you replace the water as you do it. Your clothes will be a lot less smelly, and a lot more comfortable to wear. Actually, if your clothes weren't that dirty to begin with, water and agitation would probably be enough to get them clean. After wearing the same clothes on the trail for a couple days, however, they'll probably still smell at this point, but hey, at least people won’t be able to smell you from ten feet away. 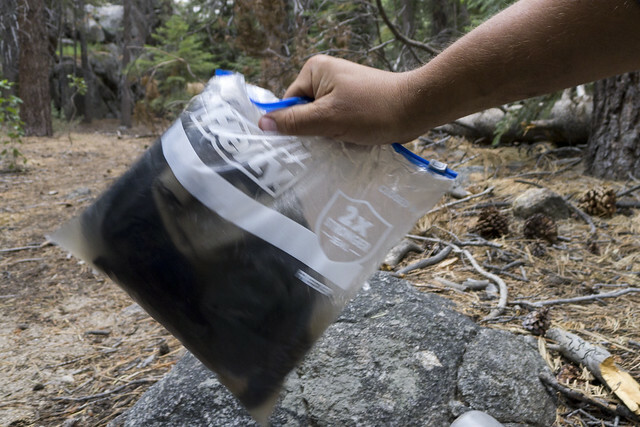 If you want to stick with slightly smelly clothes to save weight in your pack and have as little impact on the environment as possible, feel free to skip the next two steps. If you want to get them cleaner, however, it's time to get out the baking soda. 5. If you want to remove a stain, mix a little water with baking soda to make a paste, apply it to the stain, gently rub the stained fabric into itself, and then continue. 6. Fill the bag with about a quart of water and about 2 tablespoons of baking soda (more on why I don't use detergents below). Shake vigorously to mix. If you need more water to cover your clothes, just increase the baking soda as well by roughly that same ratio. It doesn't have to be exact. Now, let that soak overnight. 7. In the morning, go about 200 feet from all water sources, squeeze the baking soda water out the clothes, and then rinse them in the same way as steps 1 through 4. 8. 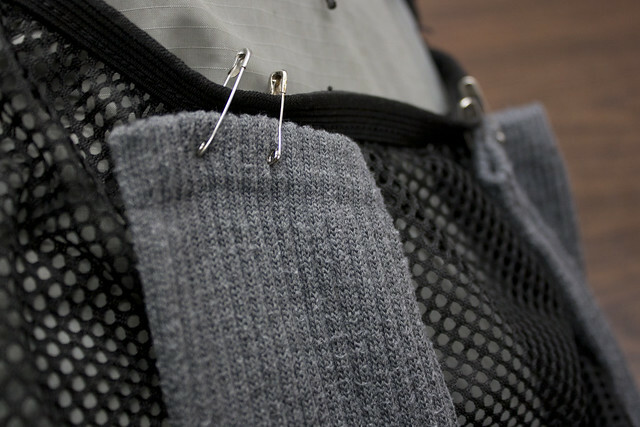 I attach the wet clothes to my backpack using safety pins, so they can dry while I hike. If it's warm enough, I'll just wear the shirt wet. The synthetic or merino wool fabric my shirts are made of dry quickly from body heat. Safety pins also work great to hang clothes on a line, so wind doesn't blow them off and so you don't have to fold them over the line, which makes them take longer to dry. The odors will continue to decrease as your laundry dries in the sunlight. 9. And finally, go find Lightfoot and have him sniff your sock to see if it worked. 1. You can mix some baking soda and a little water in the palm of your hand to form a paste and use it as a gritty hand and foot scrub to remove dirt and odors. 2. Relieve the itch of bug bites, bee stings, or Poison Ivy by applying the baking soda paste like a salve onto the affected skin. 3. You can scrub cook pots with that baking soda paste solution, as well. Or just sprinkle some on a damp bandanna and scrub away. 4. The paste can also be used to brush your teeth. It doesn't contain fluoride, but it makes a decent toothpaste if you run out. 5. You can also dissolve a teaspoon in 4 ounces of water to make a mouthwash. Slosh it around in your mouth to get rid of bad breath or relieve canker sore or tooth pain. 6. Dust some under your arms and on your feet to use it as a deodorant. Not a good alternative if you're going on a date, but it helps a little bit on the trail. 7. You can cool a sunburn, windburn, or other minor burns or rashes by saturating a bandanna in a warm water and baking soda solution and gently dabbing it onto the affected area. 8. Supposedly, you can rub dry baking soda on your roots to degrease your hair, and then just towel out the excess after 1 to 3 minutes. I haven’t tried this yet, but I have heard of people doing it. 9. Sprinkle some dry baking soda on your dirty clothes so they don’t stink up your whole backpack. That's a lot, but I'm sure there are many other uses for baking soda on the trail. I'm not totally opposed to people using certain environmentally-friendly biodegradable detergents, but I'm just not convinced any are 100% safe. 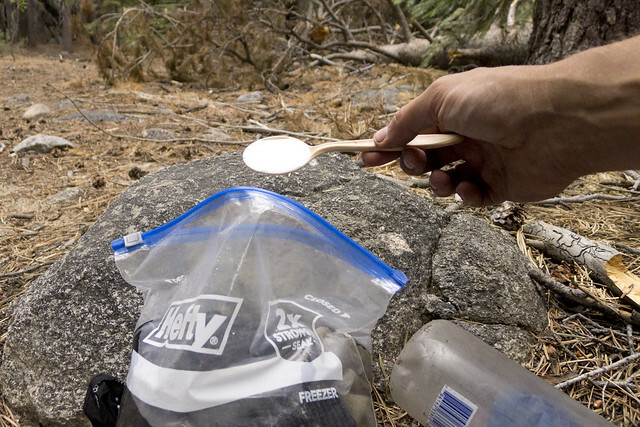 I prefer to keep as many chemicals out of the backcountry as possible and baking soda is useful in so many other ways. If you prefer to use a detergent, there are some that are considerably safer for the environment, and safer ways to use them. First, there are no detergents safe enough to dump directly into a water source, even if the detergent's label has a bright blue sky and green leaves on it, and you can only buy it in a locally-owned co-op from a barefoot hippie drenched patchouli oil. Always dump the wastewater into a 6 to 8” deep hole dug at least 200 feet from a water source, and use it sparingly. It’s hard to tell which detergents are the safest to use because they don’t have to disclose all ingredients on the label. So, choose a detergent based on what they claim they don’t add. They don't have to legally tell you if it does contain certain things, but false advertising is still illegal (sort of). For example, look for detergents that are phosphate-free, chlorine-free, fragrance-free, dye-free, and ones that are plant-based and contain no petroleum solvents. Also, in addition to the advice above, only use biodegradable detergents. Just remember that no soap is biodegradable in water. Biodegradable soaps are only biodegradable when buried in the soil. Spend enough time on the trails and you'll eventually hear something like, “I have biodegradable soap, so I just jump in the lake to bathe.” If that is how you’re using it, it’s not biodegradable soap. If biodegradable soap accumulates in water sources, it can lead to excessive plant and algae growth and decrease dissolved oxygen in the water. To print biodegradable on a label, the product just has to be “capable of being decomposed by biological agents, like bacteria, fungi, or algae, and break down into carbon dioxide, water, and biomass in a reasonable amount of time in the natural environment.” Further, it could take up to six months to biodegrade in the soil, and still be deemed biodegradable. By then, if not properly buried at least 6" in the soil and 200 feet from a water source, it could work itself into the aquatic ecosystem. Biodegradable soap is a good example of the cobra effect, when an attempted solution to a problem actually makes the problem worse. Overall, biodegradable soaps are a good thing. They are technically much better for the environment, but because the term is often misunderstood, the product is often used in an environmentally unfriendly way. So, a product with good intentions can actually end up being worse for the environment. It’s like being okay with producing more garbage, because you recycle, or leaving an energy-efficient light bulb on more often because it uses less energy. Also, since there is an assumption that it is safe for the environment, some people may end up using more of it than they would otherwise. With the method above, a couple drops is all you need. 1. You can reduce odor and the number of times you have to wash your clothes, if you wear clothes made of merino wool. It doesn't absorb body odors or hold onto bacteria like most synthetic fabrics, like those used in Under Armor for example. 2. Choose clothing made of materials that will dry fast in the sun. Hiking clothes made to quickly wick moisture from your body will likewise dry fast in the sun after you wash them. 3. 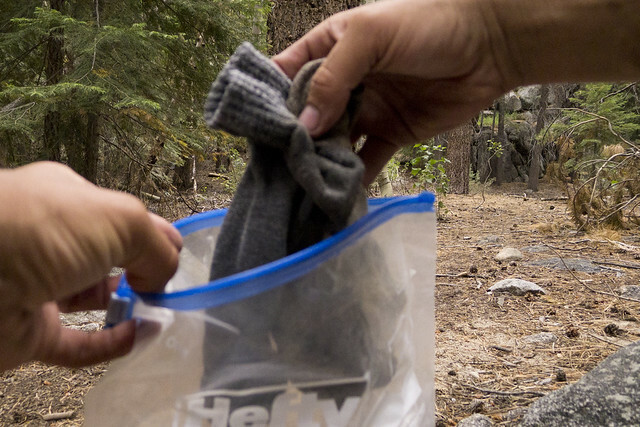 If it's overcast and your socks are still a little damp at the end of the day, put them in your sleeping bag at night. Your body heat will help dry them out. 4. Before heading to the trail, wash your clothes at home with just water. This will remove residual detergents and make it safe to jump in a lake with your clothes on to give them a quick wash.
Let me know if you have any questions, concerns, or suggestions by emailing me at ryan@abackpackerslife.com.